Barrick implemented ArcGIS Online and created the Barrick Online Mapping Portal. ArcGIS Online allows the company to store data behind the firewall while hosting the user interface in the cloud. The cloud-based platform makes spatial data available to a broad audience without increasing the load on the IT department. Barrick Gold Corporation of Toronto, Canada, is the world’s largest gold-mining company, with a current portfolio of 27 operating mines. Recently named to the Global 100, a listing of the most sustainable corporations in the world, Barrick employs more than 20,000 people and has advanced exploration and development projects dispersed across the globe. 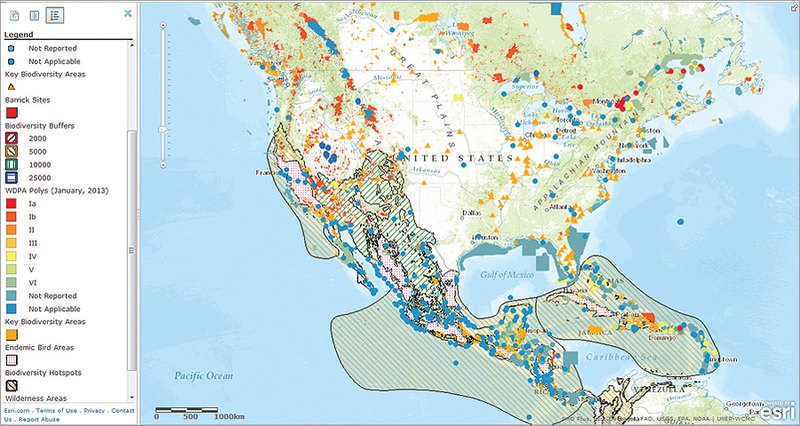 The Barrick Online Mapping Portal gives users instant access to information on biodiversity and sensitive lands for mine sites across the globe. As the world’s top gold producer, the corporation is estimated to have amassed over 100 terabytes of geologic data in addition to more than 100 years’ worth of geochemical, geophysical, and remotely sensed data inherited from acquired companies. While Barrick had developed and implemented an effective spatial data management (SDM) workflow, it is used primarily by the company’s force of geospatial professionals with hundreds of ArcGIS for Desktop licenses. Nevertheless, there was a much larger group within the mining company that required access to Barrick’s spatial data to make informed decisions. This prompted the organization to look for a complementary solution that would extend access to spatial data. 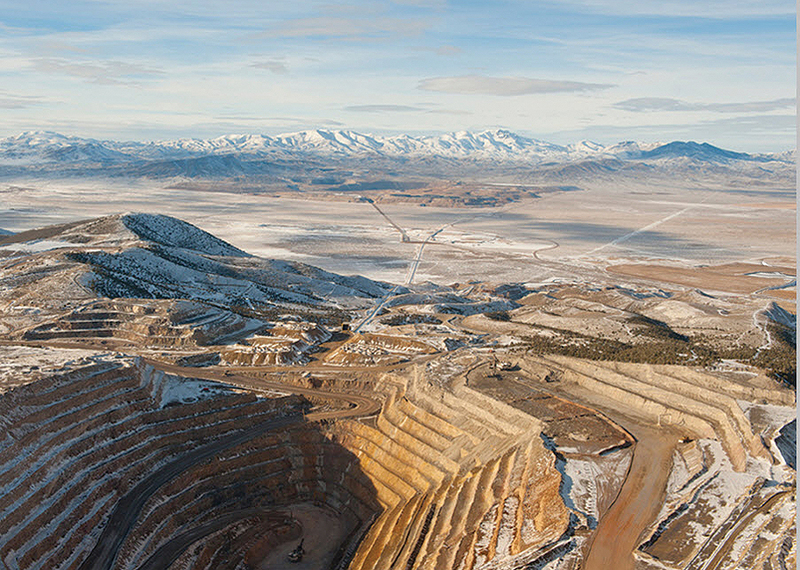 To expand access to a growing volume of cataloged data generated by the SDM workflow, Barrick expanded its use of ArcGIS technology and implemented ArcGIS Online to create the Barrick Online Mapping Portal. Leveraging the SDM, Barrick completed metadata for more than 100,000 datasets, a necessary precursor to adding data to the Global Data Catalog. A custom metadata editor is used to complete the metadata; the MXDs are then published to file geodatabases stored in an MXD repository on the network. Each night, a metadata software program “spider” harvests new metadata and adds it to the Global Data Catalog. This allows data, now available on the Barrick network rather than individual laptops, to be searched and used long after a project has been completed. One of Canada's Barrick Gold Corporation's 27 operating mines. Selected datasets are then made available as web services published to ArcGIS Online. Services can be created from virtually any existing spatial dataset—both vector and raster—including geology, geophysics, geochemistry, structure, drilling, and environmental monitoring. Through the Barrick Online Mapping Portal, Barrick data can be combined with a large collection of online basemaps. Web apps are also made available through the portal, including the Global Data Catalog and internal Global Deposits database, both of which were formerly stand-alone applications. Discipline-specific data compilations allow staff to access directly the data that is vital to their work. “By leveraging a cloud-based platform, we’ve been able to outsource most of the administrative overhead, allowing us to make spatial data available to a much broader audience without increasing the load on an extremely busy IT department,” says Allen. By simply opening a web browser, senior managers can now make critical determinations, such as What is our biodiversity risk globally? and How many sites do we have around the world at various stages of exploration? Key decision makers are able to interact with the data and get a better understanding of global issues. When mine site expansions occur, relevant infrastructure data can be integrated into an interactive web map. This may include satellite imagery, geology, protected areas, road networks, and local towns. This map can be referenced to analyze changes over time and to monitor activity as outside the fence. Because mine sites in developing countries often attract large numbers of local people, tracking the growth and distribution of this population is important in the event of an expansion. The home page was developed using ArcGIS Online, showcasing Barrick's unique look and feel. Featured maps and apps have also been added to the home page. To ensure compliance with organizational policies, ArcGIS Online allows Barrick to store data behind the firewall while hosting the user interface in the cloud. Publishing capabilities are restricted to a small group, typically the GIS expert or spatial data manager at each site or office. These specialists create and publish specific data packages around ongoing projects and restrict data access to relevant users by creating groups in ArcGIS Online. This ensures that sensitive information always remains confidential. In addition to creating site-specific data packages, Barrick is planning to leverage the cloud platform to create a travel security map for all its mining sites across the globe. The map will display risk factors for each site, including political instability, earthquakes, tsunamis, typhoons, and other threats. The site-specific risk factors will be drawn from a spreadsheet managed by the security team, and any changes made will be automatically reflected on the map, providing users with a live feed of security-related updates. Future plans include leveraging the Compare Maps template within ArcGIS Online, which will allow users to view datasets relative to multiple mine sites on a split screen. Barrick also hopes to link the data catalog directly with ArcGIS Online so that data can be searched in the cloud using metadata keywords. For more information, contact Iain Allen, senior manager—GIS, Barrick Gold Corporation.